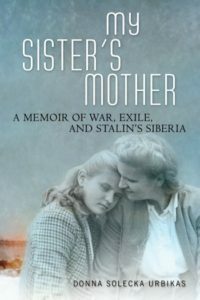 The following is a guest post by Donna Urbikas, author of My Sister’s Mother: A Memoir of War, Exile, and Stalin’s Siberia. A couple of years ago I took myself on a cross-country tour of writers’ conferences where I could pitch my newly finished manuscript, My Sister’s Mother: A Memoir of War, Exile, and Stalin’s Siberia. Reception was great except that I am not famous, so who would care? Fortunately, the University of Wisconsin Press did and picked it up quickly—so much so for the image of university presses only being interested in “academic” works. Nevertheless, intertwined within the story of my mother and sister’s deportation and enslavement in Siberia at the start of World War II and my growing up hearing that story way too many times, there is an easy history lesson, a lesson that is not generally taught in American schools, one that was not taught during the Communist era in Poland after the war ended in 1945 up until the Communist government was ousted in 1989—a long time to be left ignorant of such monumental facts! Of course those of us in America and in Poland who had families who survived those ordeals, knew all too well about it—my family in Poland could’ve been arrested for such talk during those Communist times while my parents and other Poles who immigrated to America spoke of it as often as they could, often to unbelieving souls—during the war, America did not want to upset Stalin and the Soviet Union while fighting Hitler and Germany. After the war, we were embroiled in the Cold War, so our Polish family stories were overshadowed. The American experience of WWII really begins in 1941 with the bombing of Pearl Harbor. However, the start of the war was really in September of 1939 when Germany attacked Poland from the West and then two weeks later the Soviet Union attacked from the East. My parents were caught up in that turmoil with my mother and sister living in what was then eastern Poland while my Polish Army officer father was defending the bridges nearby. At that point my parents had not met—that would come much later in the Soviet Union. My father was captured by the Soviets and sent to a prisoner-of-war camp in Russia while my mother and sister were sent to a labor camp in Siberia. As a child I thought everyone in America had similar experiences so I didn’t consider my family’s story unique and by the time I reached adolescence I was bored with it. I write in my book, “Who would keep talking about all this horrible stuff over and over again, if they weren’t crazy?” It wasn’t until I became a mother myself could I begin to understand my mother and her efforts saving my sister throughout all the hunger, disease, dangers, and numbing cold. I began to understand that special bond they shared having survived it all. I was born after the war and didn’t go through anything like that. Thus, my sister and I had very different experiences of the same woman. 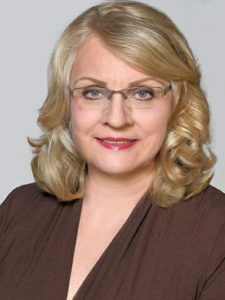 More about the author and her work: Donna Urbikas’ Website. Born in Coventry, England, Danuta or “Donna” Urbikas immigrated to the USA with her parents and sister, the subjects of the book, in 1952, settling in Chicago, Illinois, and growing up in the Polish community. After attending Catholic grade schools and a public high school in Chicago, she graduated from the University of Illinois—Chicago Circle with a degree in biology and began teaching high school biology. In 1976, she took her first trip to Poland to meet relatives and explore her parents’ hometowns. On the cusp of the Solidarity Movement, her movements were restricted by the Communists and the trip became a significant life experience. Later, she graduated from the Illinois Institute of Technology, Chicago, Illinois, with a Master’s Degree in Environmental Engineering. The author has published her thesis, technical articles, worked as a teaching and research assistant and served as president of the Society of Women Engineers in Chicago, participating in numerous public speaking engagements. She went on to work as an environmental engineer and project manager in charge of water and wastewater compliance at coal and nuclear power plants and as an industry spokesperson. The author is a cancer survivor, currently working as an Illinois Licensed Real Estate Broker, community volunteer, and writer, living in Chicago with her husband.